As a homeowner or business owner, you might not know too much about your property’s gutter system — except that it’s designed to keep water from inclement weather off your roof. You should regularly inspect your building’s gutters to ensure there’s no need for gutter repairs, especially before any potential problems get out of hand and end up costing you more than if the problem was tackled ahead of time. But what exactly entails the need for gutter repairs? In this blog post, we’ll go over five signs you need professional gutter repairs in Syracuse when you’re doing your routine gutter inspection. If you’re looking for a gutter company in Syracuse, New York, choose our team at Iron Horse GutterWorks. We offer many different types of gutter services, including repair, maintenance and installation. Call us today for a free gutter quote. Here are a few signs that you might need some gutter repairs done by a gutter professional in Syracuse. 1. Your gutters are leaking. There are multiple reasons your gutters may be leaking. Maybe tree branches somehow poked a few holes into them. 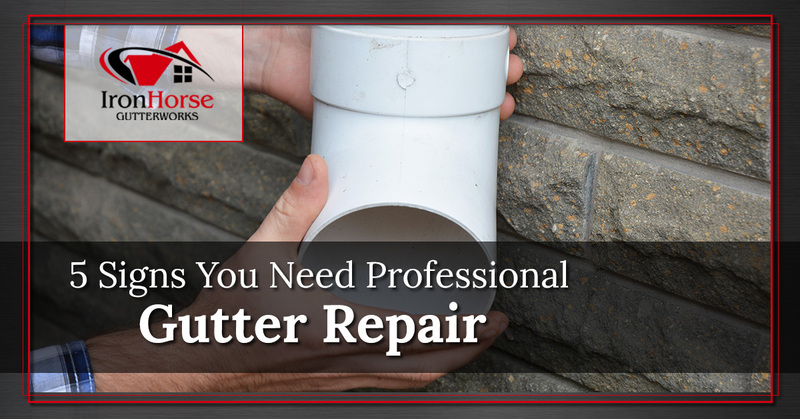 Maybe rust slowly ate away at the material, some screws came loose to loosen the structure of your gutter system, or your gutter’s caulk eroded over time. Whatever the case may be, all you know is that water isn’t staying in your gutter system like it’s supposed to. That’s a sign for some professional gutter repair assistance. A professional can use the proper tools or sealing agent to plug any holes, or they might use metal flashing to patch up the area that is causing the leak. If you ignore any leaks, your home’s interior and exterior is more prone to rot and mold, so we suggest getting any leaks fixed right away. 2. Your gutters are sagging. When your home’s gutters collect too much water in them, you might notice that they start to sag. This is never a good sign because if they become too heavy, they can loosen or break completely. When this happens, any rainwater collected in them won’t have the ability to drain correctly, leading to a plethora of future problems for your home. A gutter expert can repair any sagging issues as they arise so your gutters will look like brand new all over again! 3. Your gutters are overflowing. Similar to the issue above, a sign you’ll need a gutter repair expert is if your gutters are overflowing with water anytime a storm flows through town. Not only is this issue slightly annoying, but it can cause major damage to your home’s foundation. 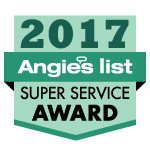 The main reason for this issue is your gutters are likely clogged with leaves and other natural debris. If you don’t feel comfortable enough to remove any debris or address this issue yourself, a gutter repair expert is trained to determine the reason for your overflowing rain gutters. 4. Your garden is being flooded. If you’ve noticed your home’s garden or the natural plants underneath your home’s gutters are constantly flooding, that might be a sign you need gutter repair from a professional. The downspouts of your gutters are designed to direct any rainwater to a specific area, and if water isn’t solely collecting in that designated area, other areas of your home have the potential to be severely damaged. This is an issue that requires immediate professional assistance because if the flooding makes its way to your home’s foundation, it could be compromised. 5. The ceiling of your home is damp. Lastly, if you notice the interior ceiling of your home is damp after a major storm, this could be more than a roof problem — there’s a chance it is a gutter problem. Gutters are designed to steer water away from your roof, ultimately keeping your ceiling dry and safe. If your gutters aren’t working properly, water could be seeping into your ceiling. A gutter repair professional can find the source of what is making your ceiling damp, and from there, direct you with proper instructions of what you should do next or make any repairs themselves. Ignoring these signs will ultimately cause your home more damage than if you were to address them right away. Gutter and home repair costs add up quickly, and they are usually more costly the more you let the problem get out of hand. We recommend tackling any gutter repair problems immediately, and seeking the help of a gutter repair professional in Syracuse is your best bet. At Iron Horse GutterWorks, our team of gutter repair experts has years of experience handling these gutter issues listed above and more! We can help you with many of your professional gutter repair needs, and we also offer gutter installation and gutter cleaning services! For more information or to book an appointment, call us today at (315) 512-2424 or fill out our online form. We offer a free gutter quote for all projects!